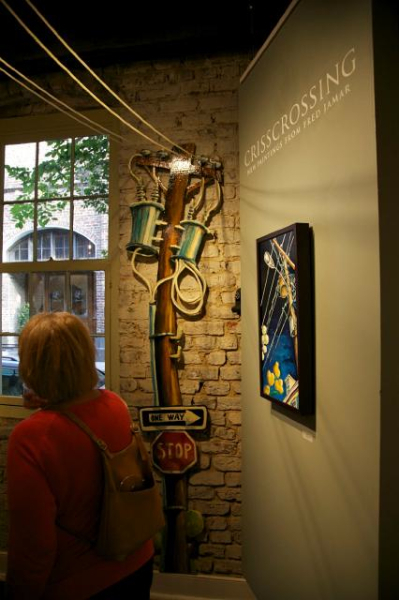 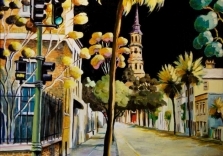 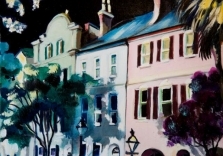 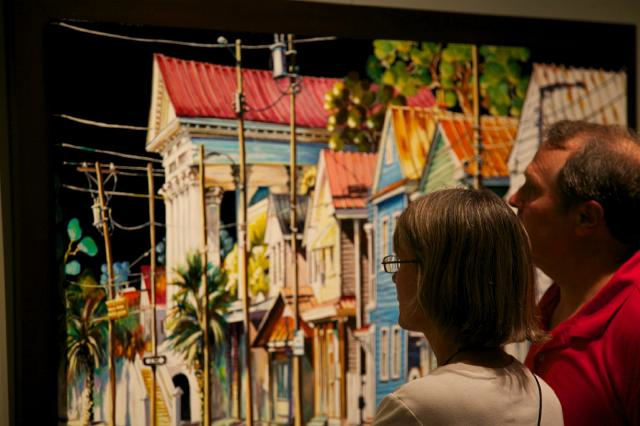 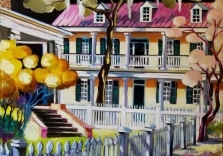 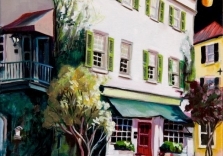 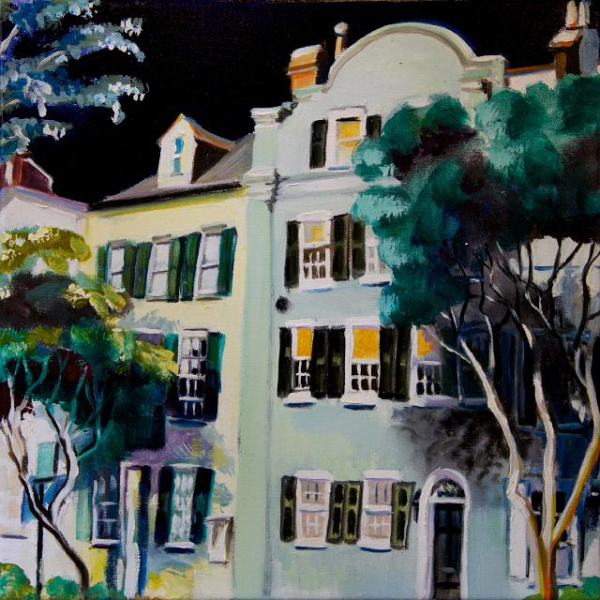 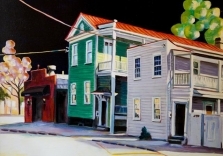 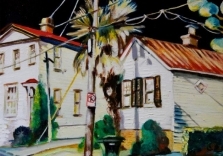 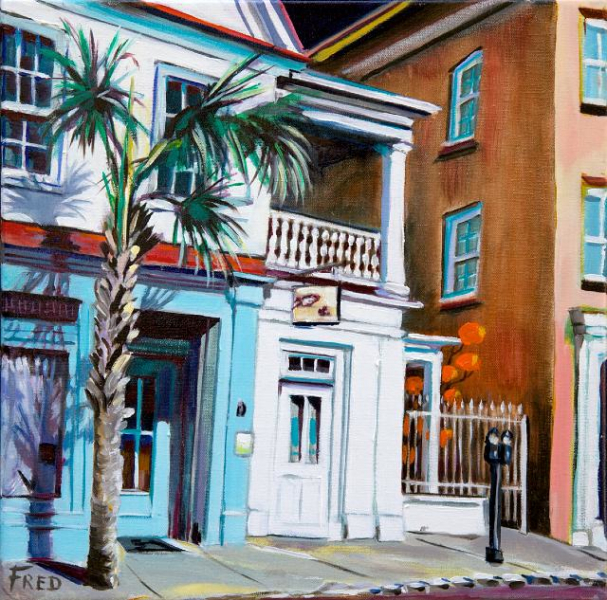 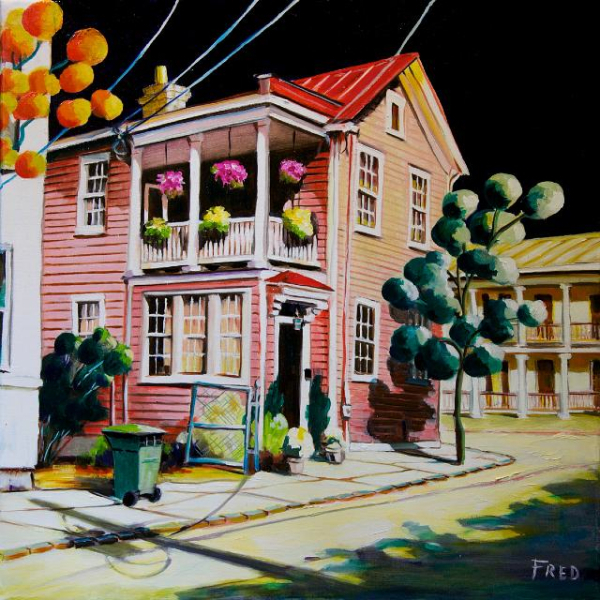 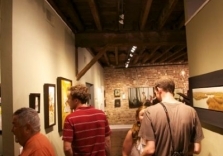 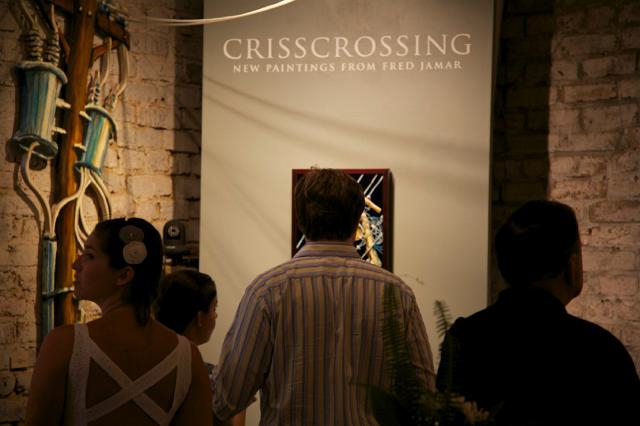 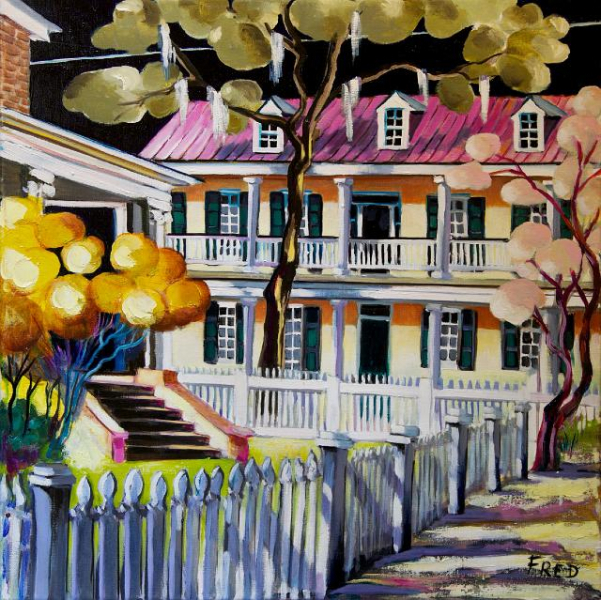 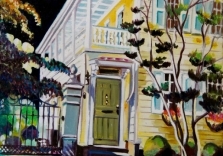 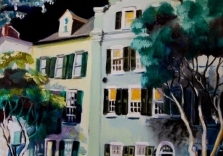 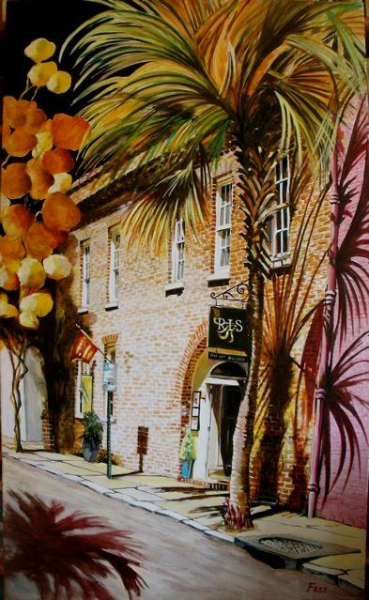 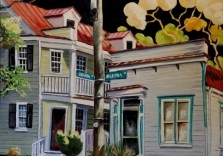 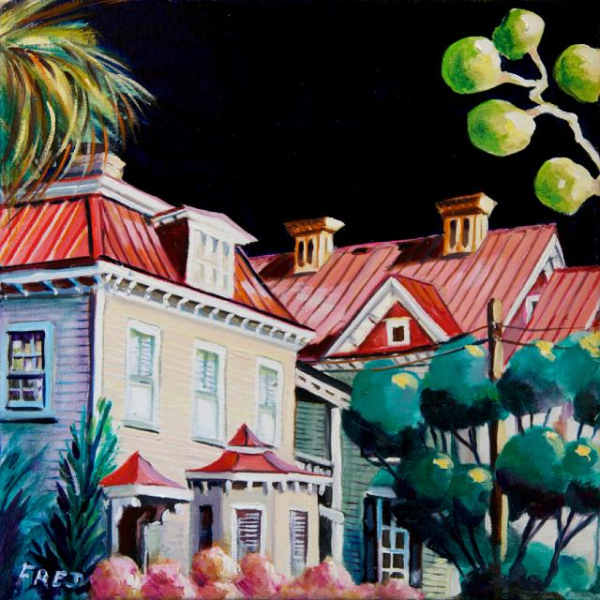 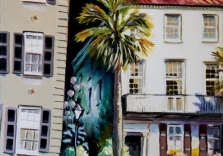 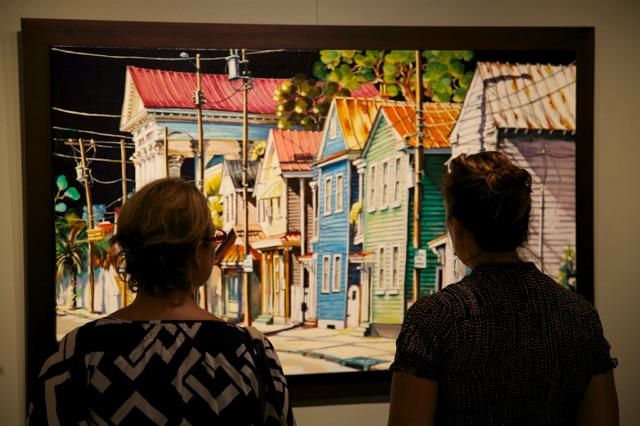 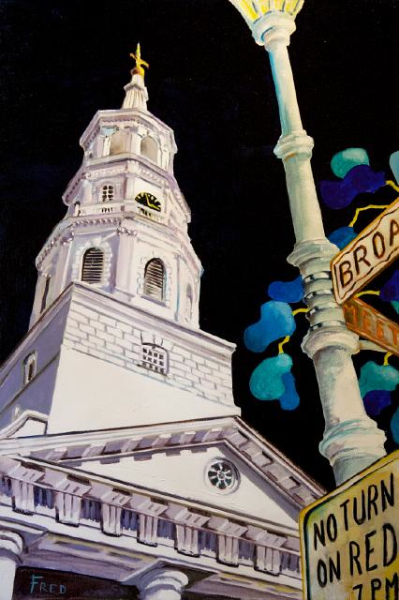 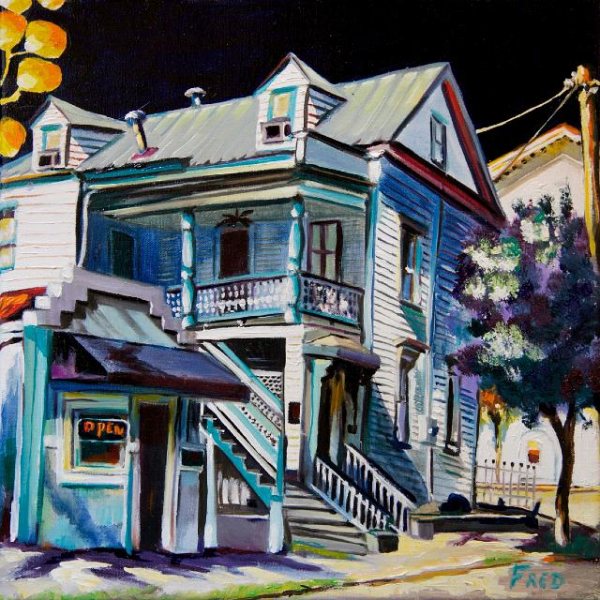 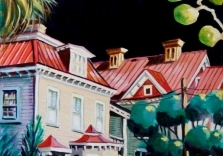 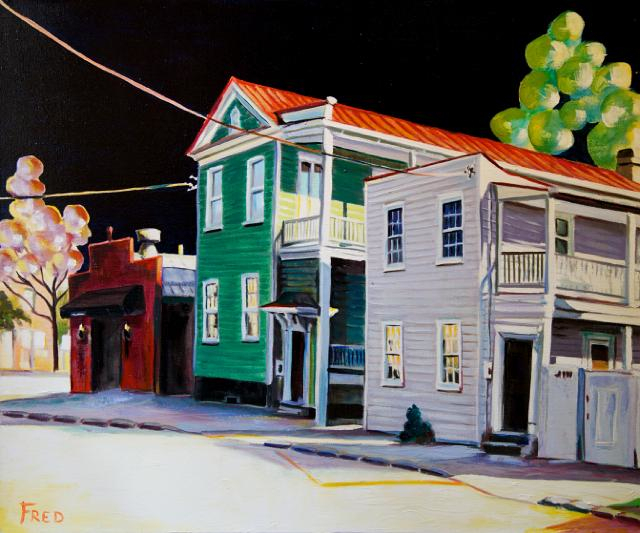 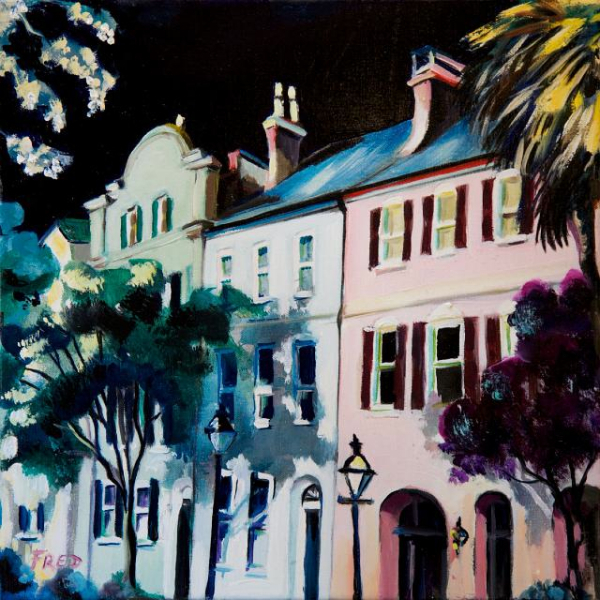 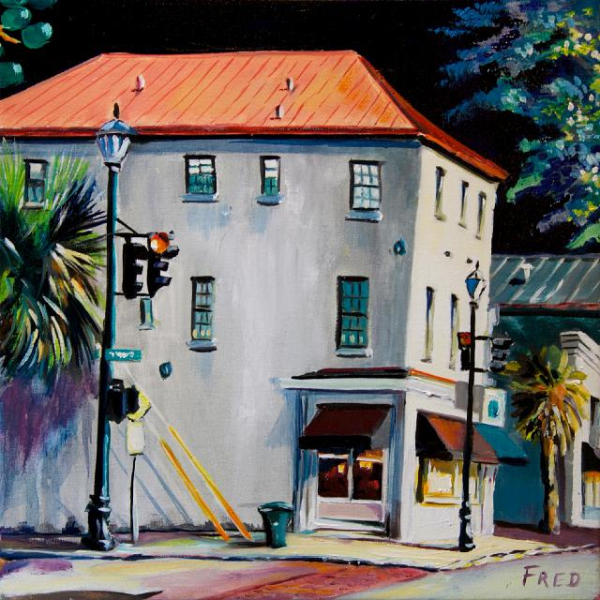 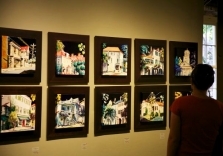 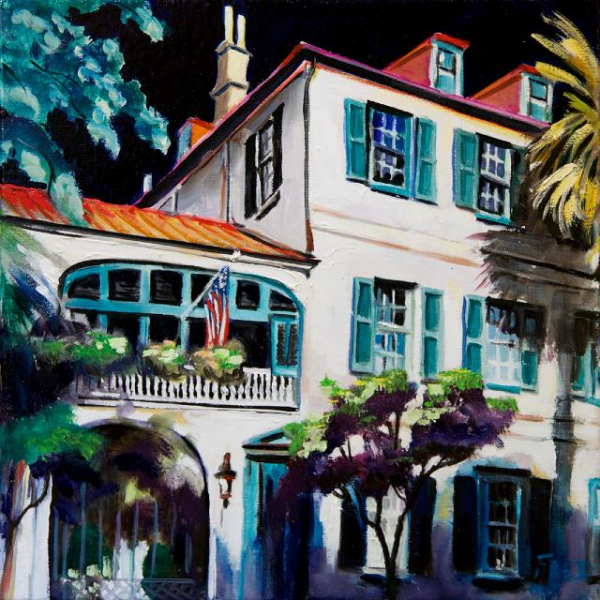 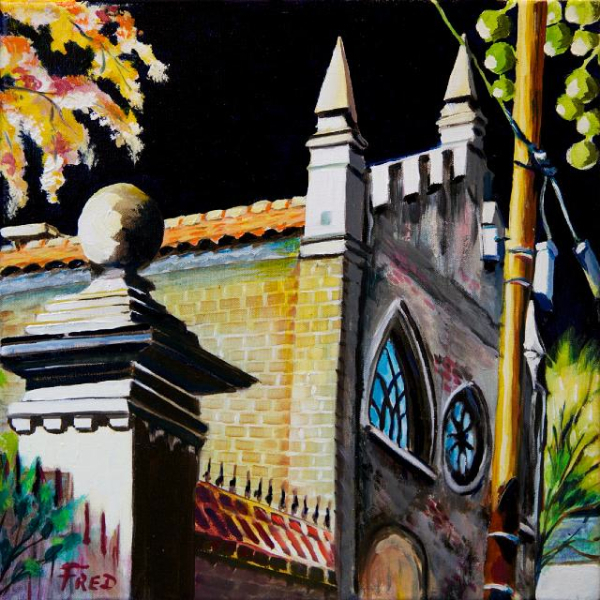 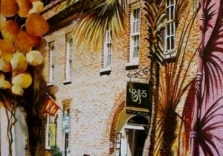 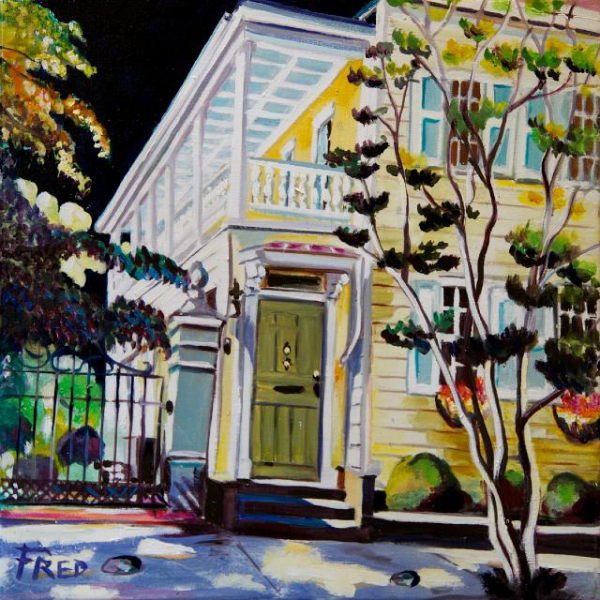 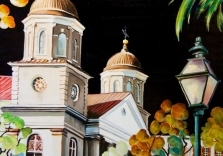 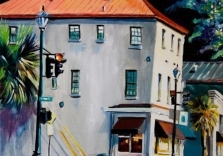 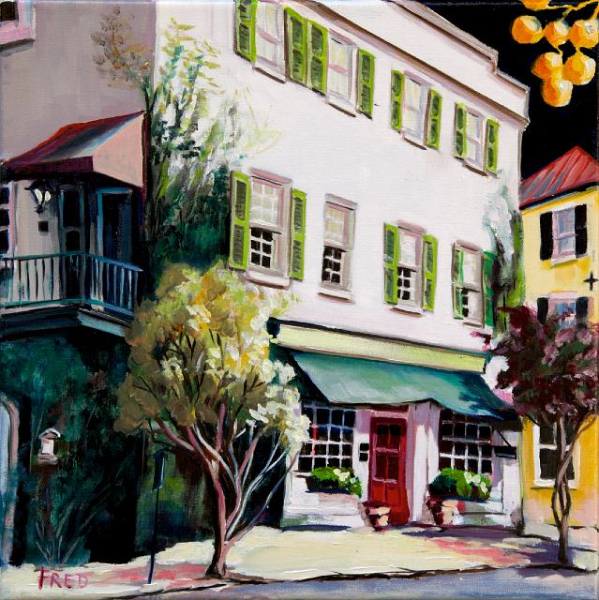 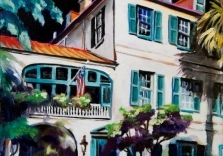 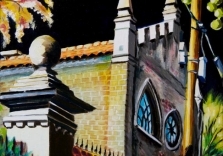 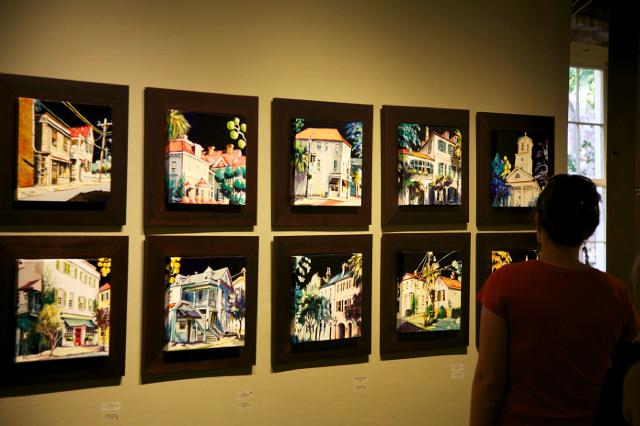 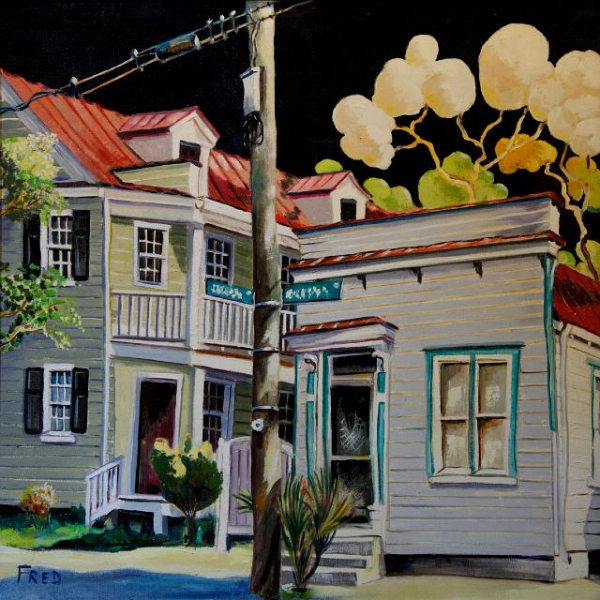 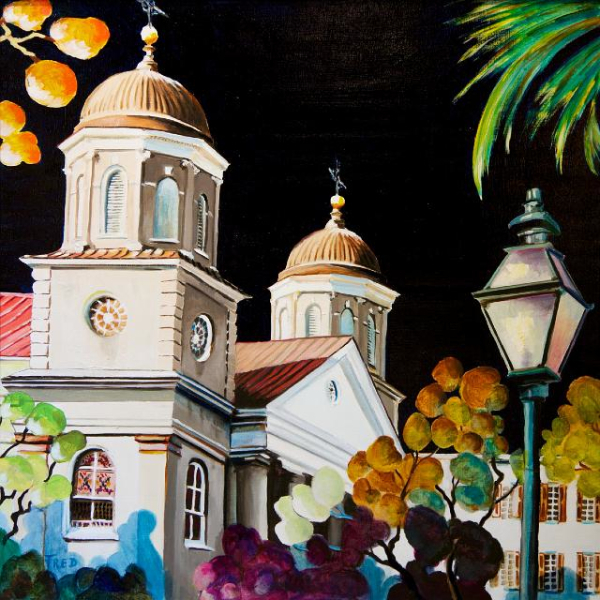 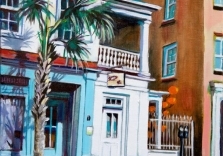 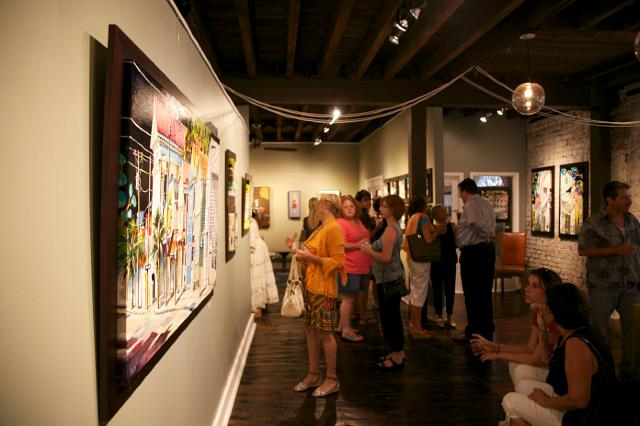 CHARLESTON, S.C. – Robert Lange Studios upcoming exhibit, “Crisscrossing,” features the work of the cityscape painter Fred Jamar. 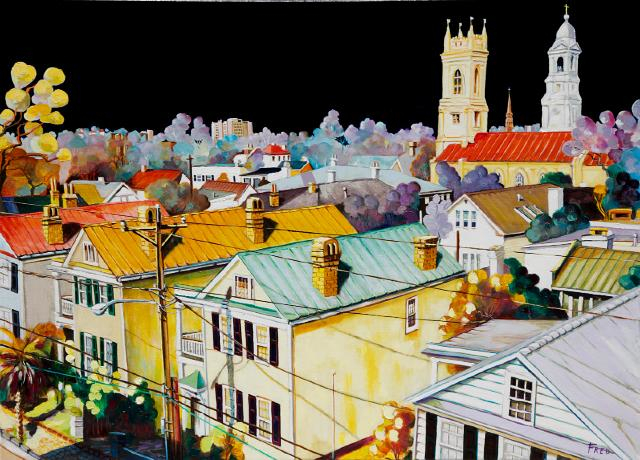 This latest series of paintings capture intersecting moments of an old city while letting the image tell a universal story about a place or experience. 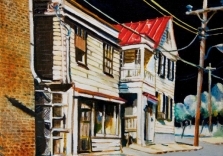 The works represent the next chapter in a continuing storyline of the artist’s five decade long painting career. 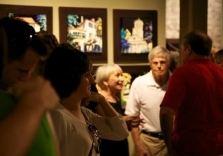 All are welcome to attend the August 3 event from 5–8PM. 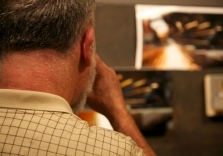 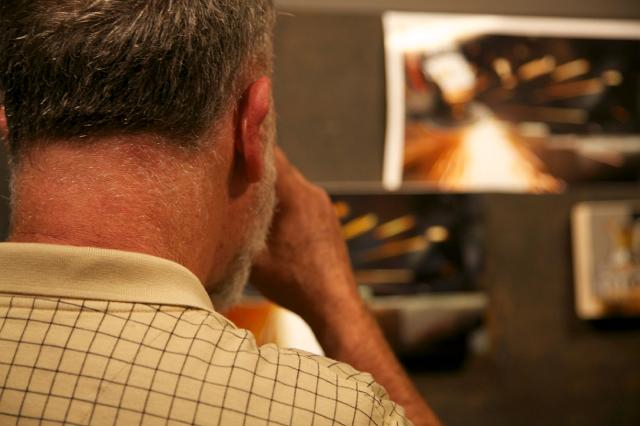 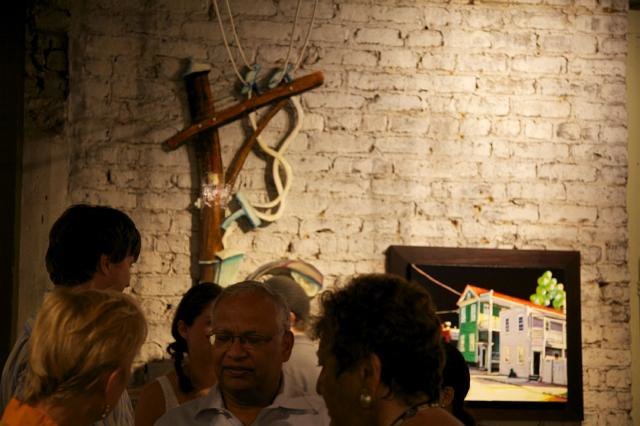 The artist will be on hand to answer questions and the work will hang until August 24 and can be seen daily from 11-5PM. 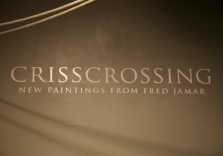 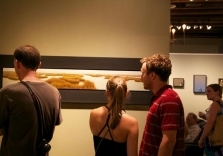 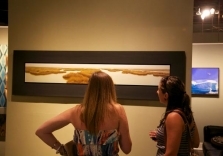 “Crisscrossing” showcases the paintings from a career that began near 56 years ago. 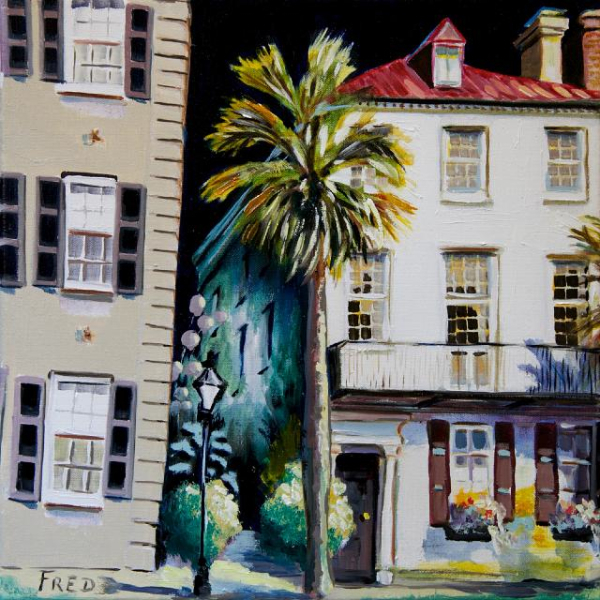 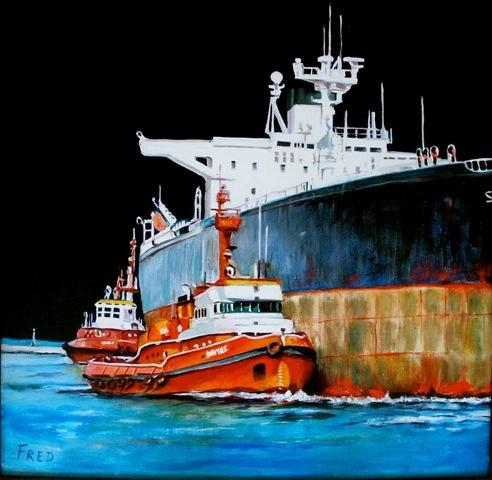 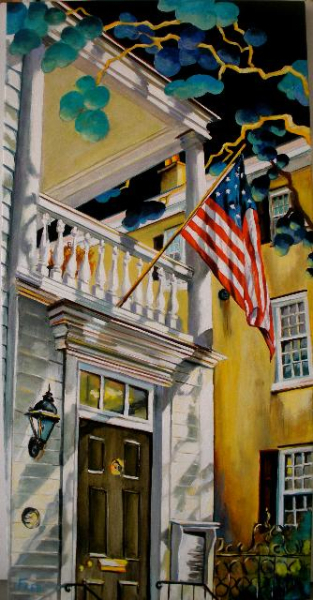 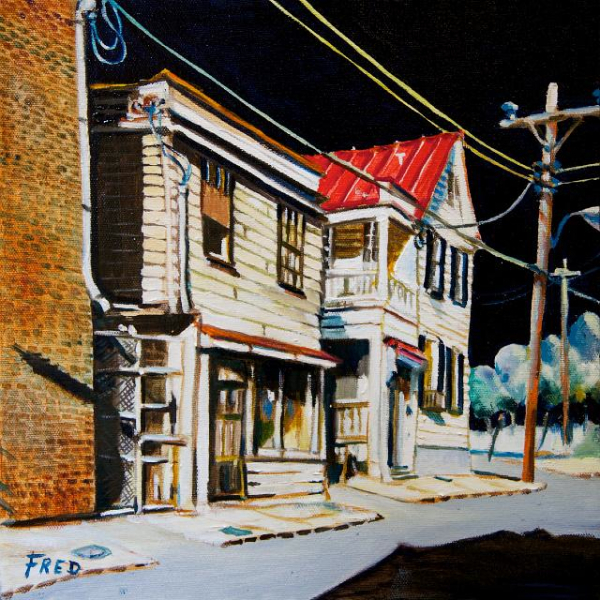 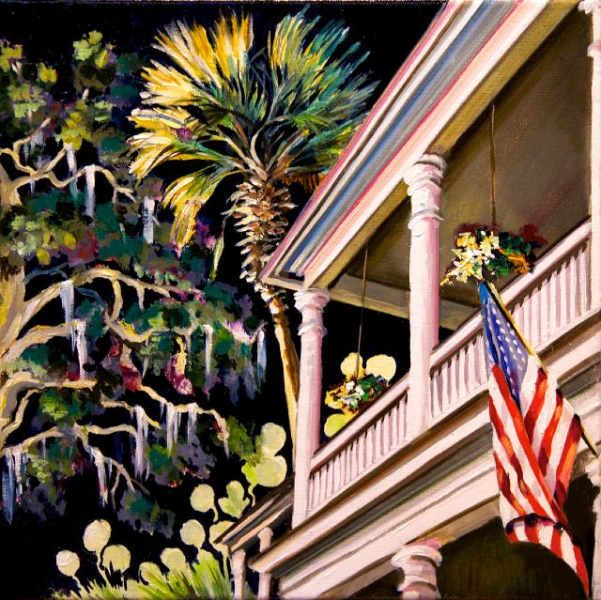 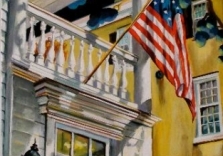 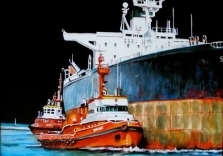 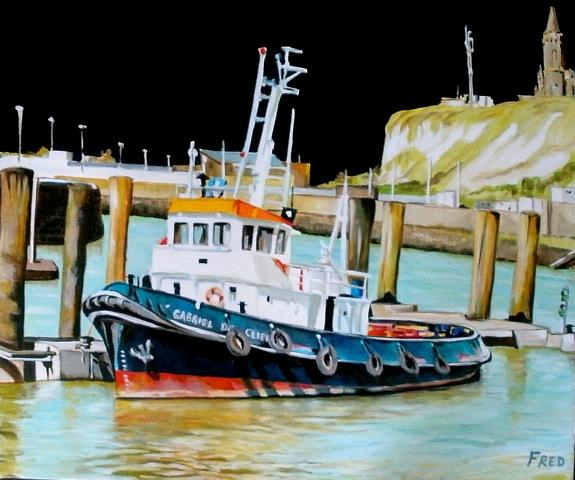 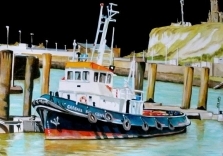 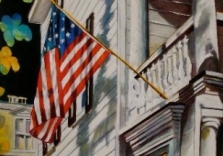 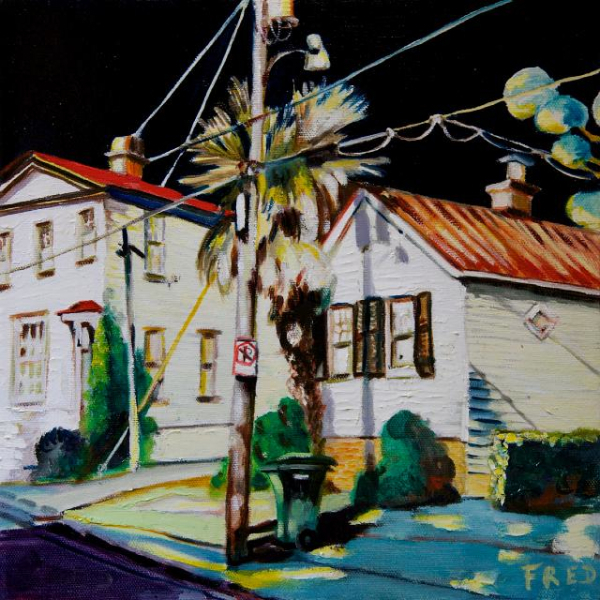 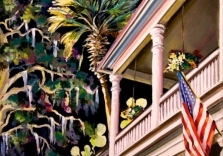 Charleston favorite, Fred Jamar, who was born in the village of Stembert in Southern Belgium, began painting aboard a freight ship while in the Merchant Marines. 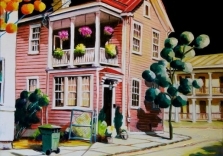 “My first painting was on a scrap of discarded tarp. 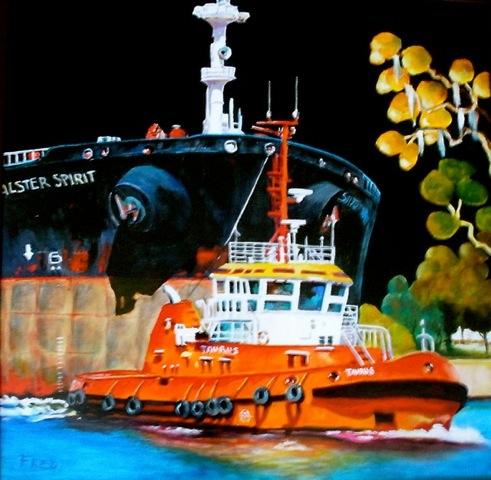 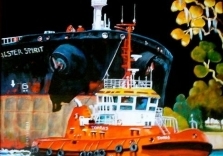 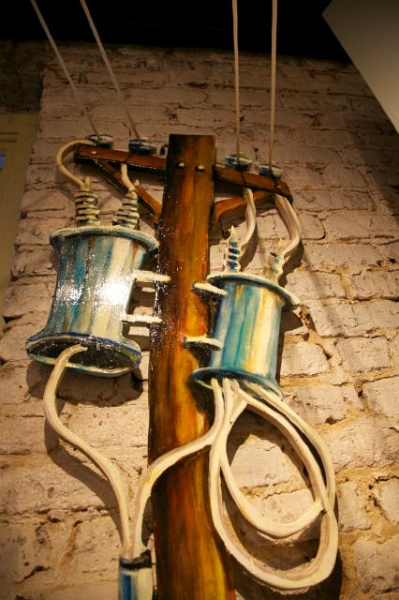 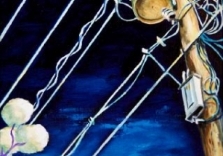 I used the paint that color-codes the ships pipes and made brushes out of old clothes,” said Jamar. Now, hundreds of paintings later, Jamar is capturing the moments where an old world and a new world intersect. 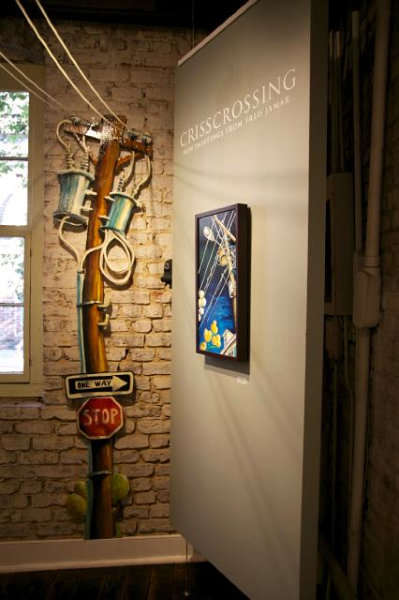 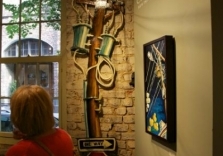 The works include everything from power lines to trashcans, from parking signs to palm trees. 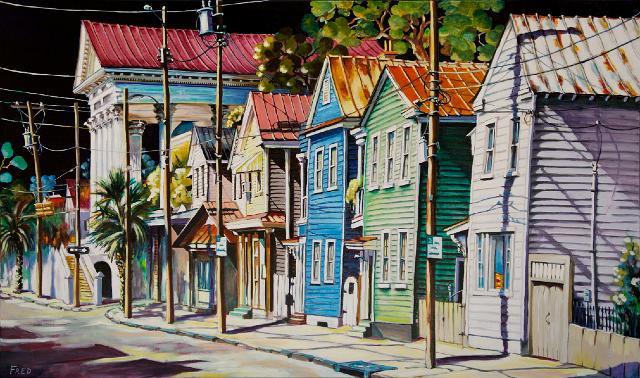 “I paint every part of the street’s story and I add in a little imagination,” says Jamar. 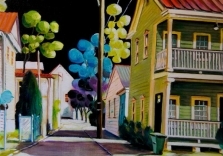 When it comes to painting, Jamar believes its important not to be to serious– in these most recent works he uses the landscapes from his immediate surroundings as primary images and then incorporates elements from his imagination, including brightly colored and highly stylized bubble trees. 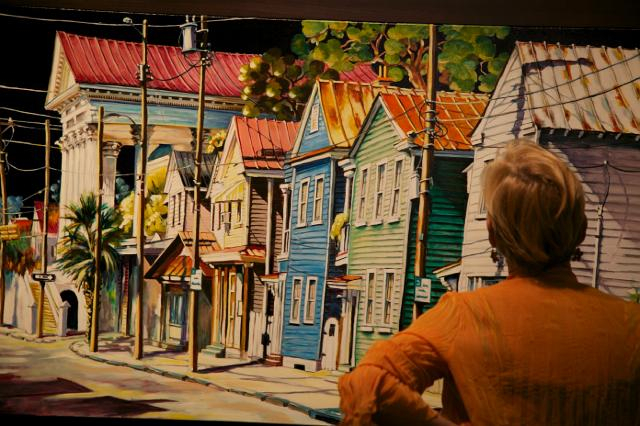 The end result is a fanciful memory of intersecting streets. 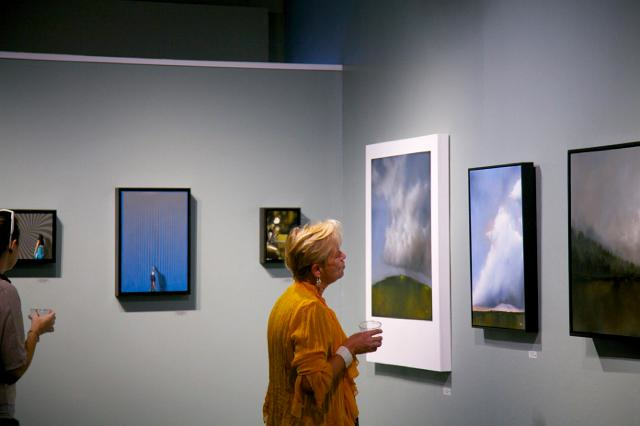 The works are filled with strong shadows that hint at a certain time of day, at the same time the dark Prussian blue skies create a feeling of drama and privacy, giving these paintings a familiar but distant feeling. Although the works are devoid of people the colorful and bold perspectives, including aerial views, show a new perspective of the world. 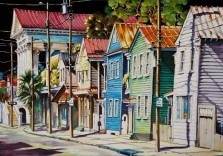 The artist says he draws inspiration from familiar colors, crisscrossing power lines and even old chipping paint on clapboarded houses. 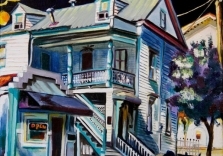 “These old houses are already filled with so much texture and pattern it’s easy to use them as inspiration,” says Jamar. 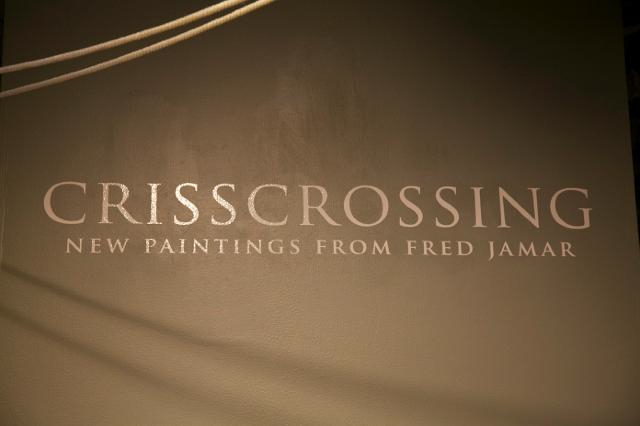 Jamar describes the title painting for the show “Crisscrossing” as a piece that depicts a melting pot of lives and personalities. 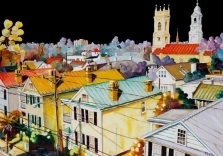 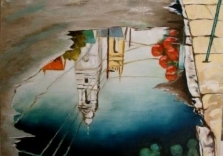 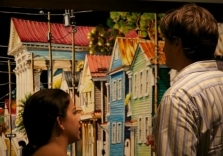 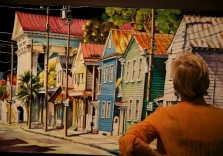 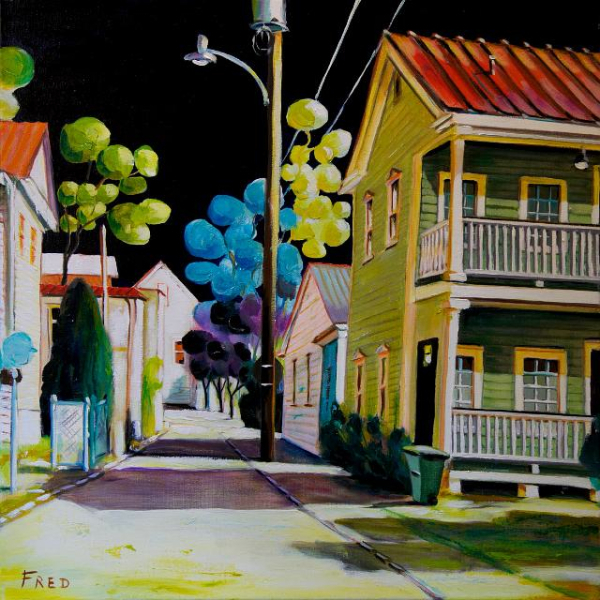 The piece is a large 30-by-60 inch oil on canvas depicting a row of colorful houses standing shoulder to shoulder on the canvas as light bounces off the fronts of their faces and power lines sag above. 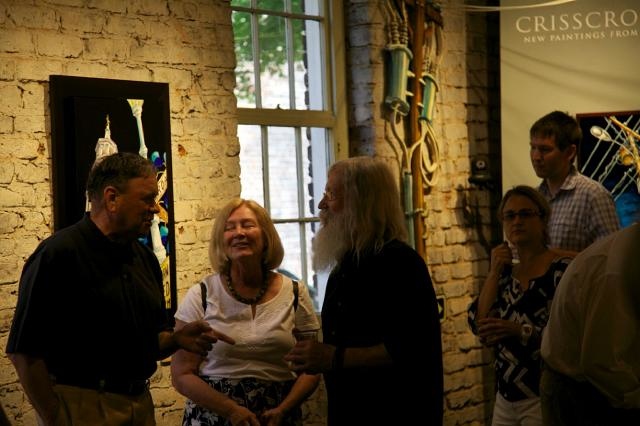 “Art keeps you young. 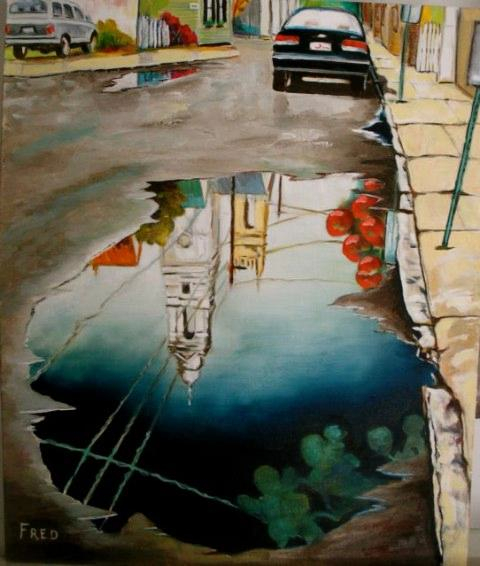 When you’re painting, you forget about pains and aches; you float. 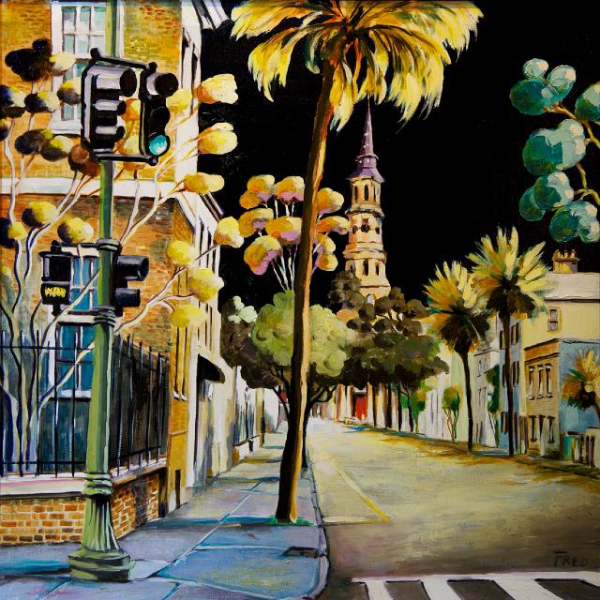 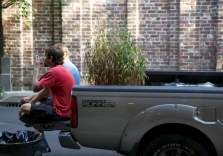 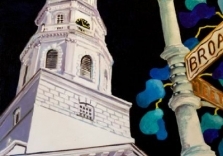 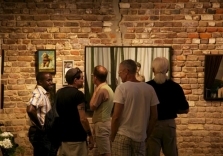 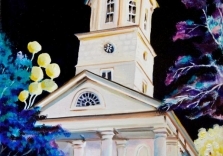 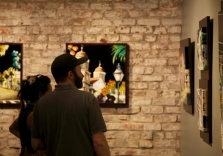 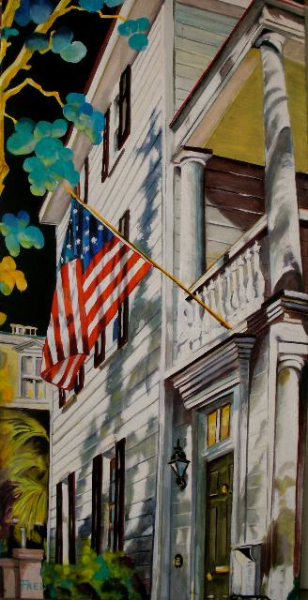 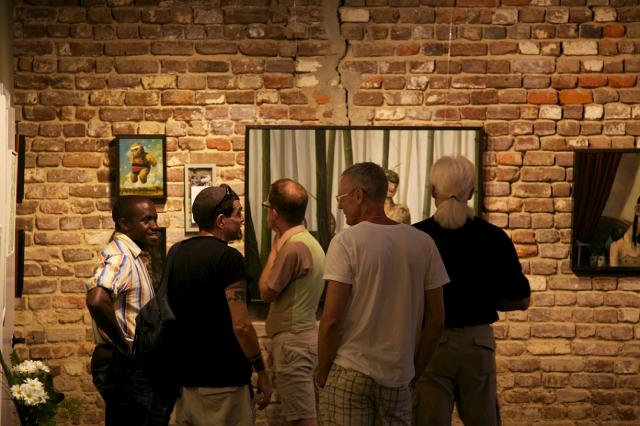 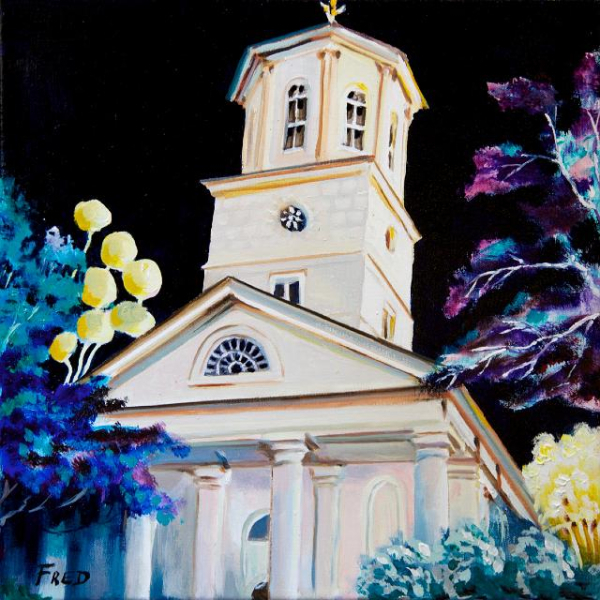 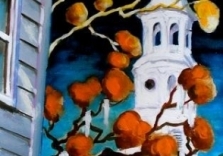 Even when I’m painting something I know, such as Charleston, everything is like a dream,” Jamar said. 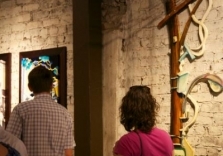 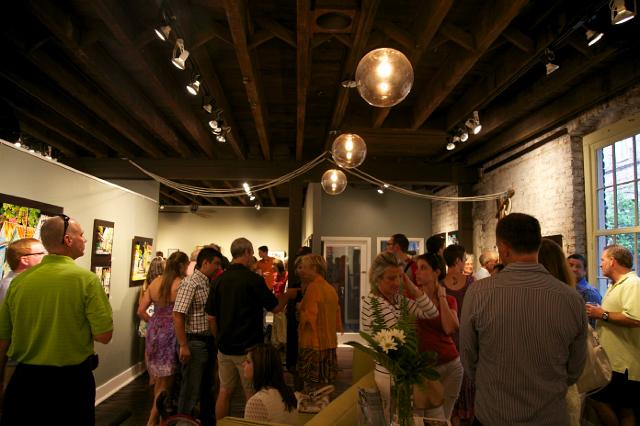 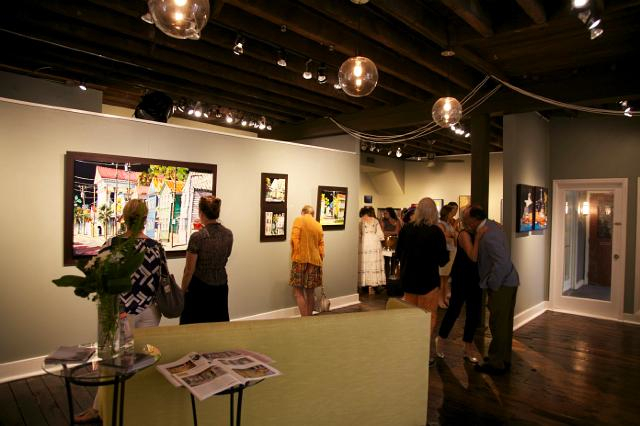 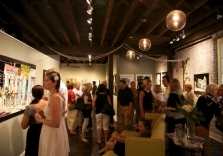 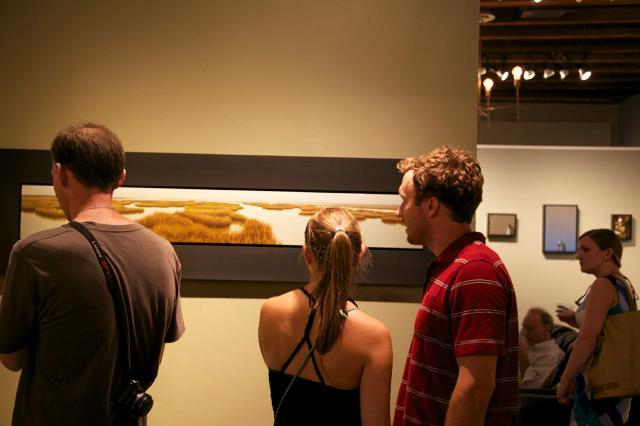 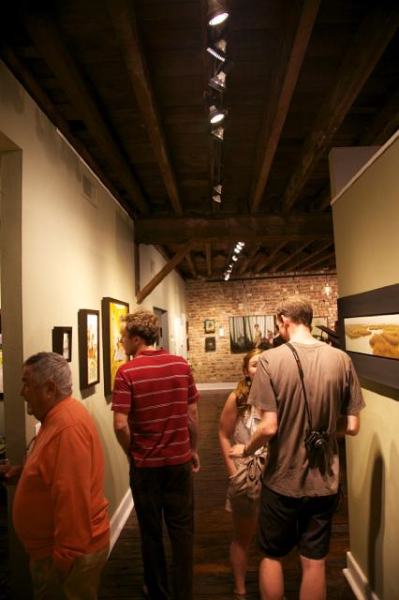 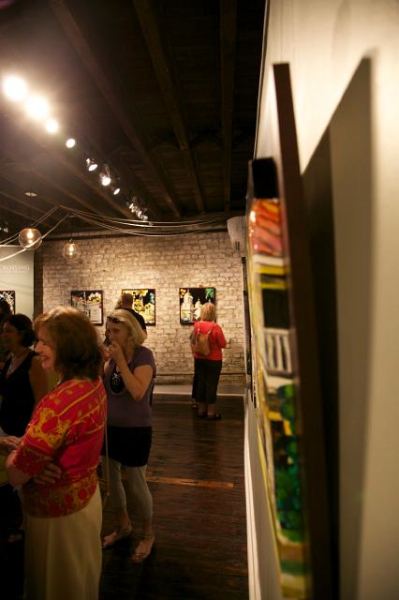 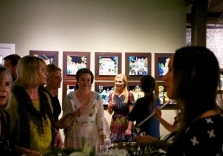 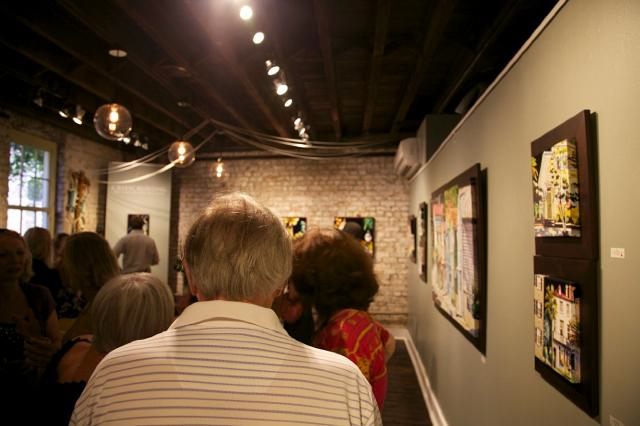 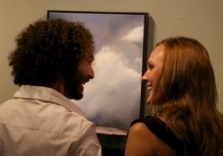 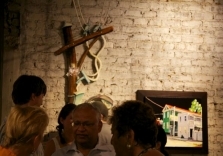 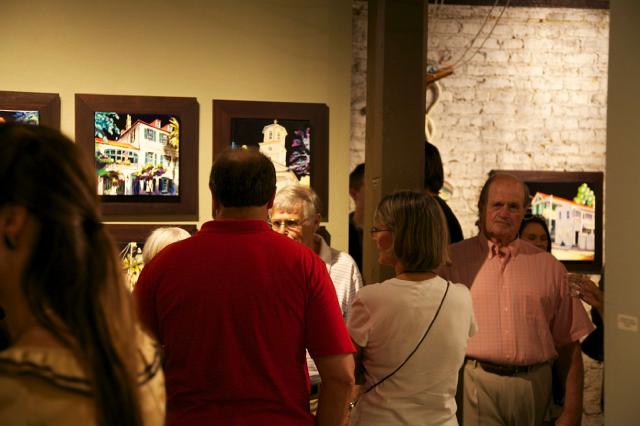 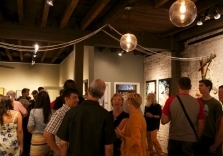 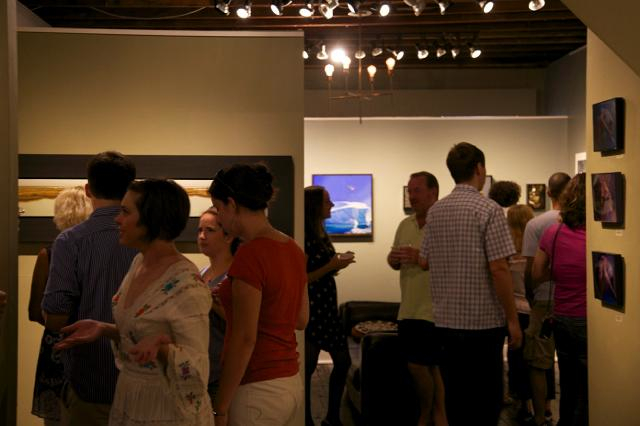 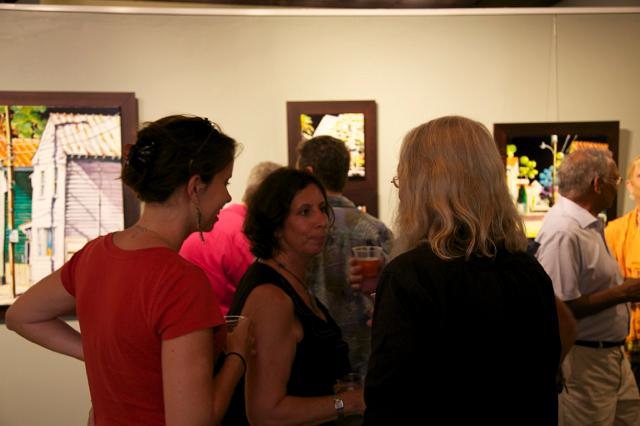 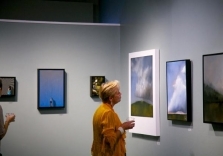 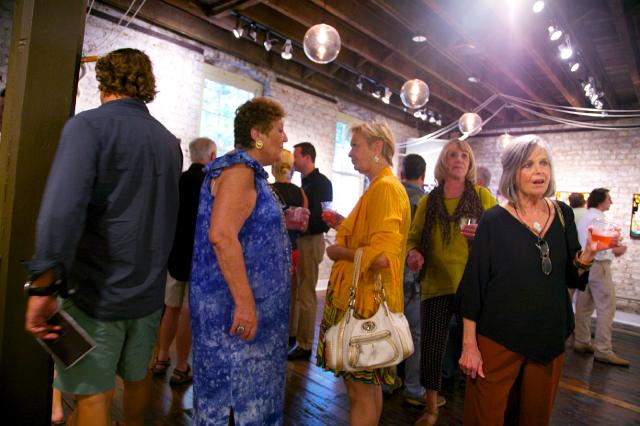 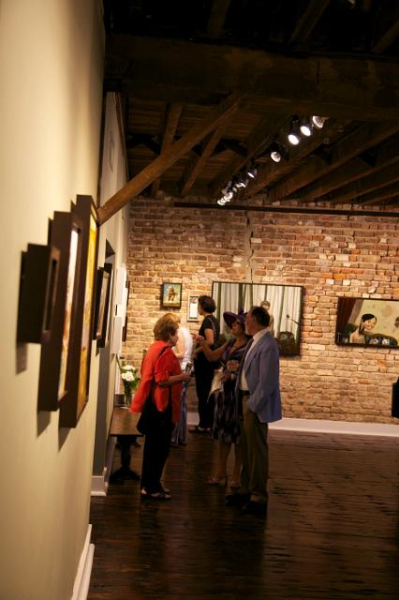 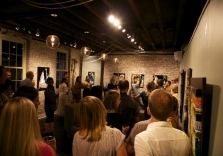 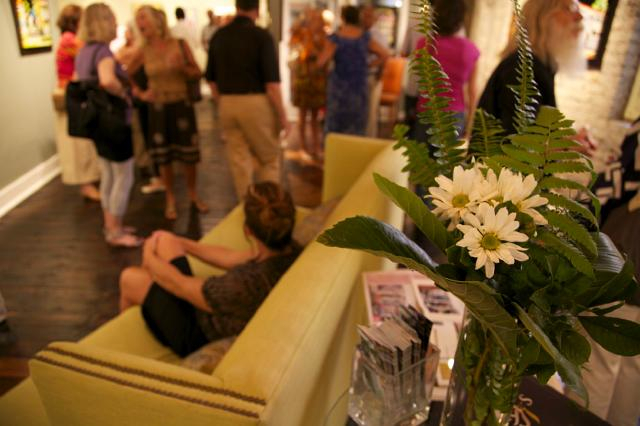 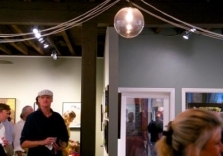 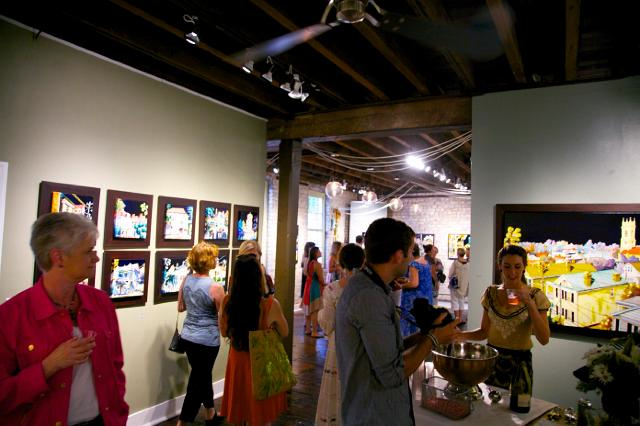 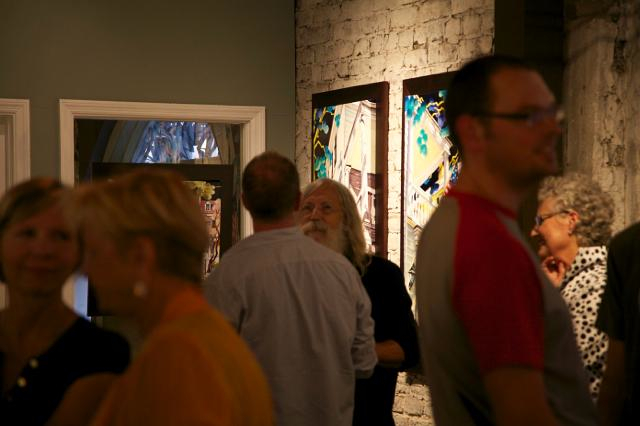 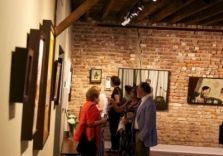 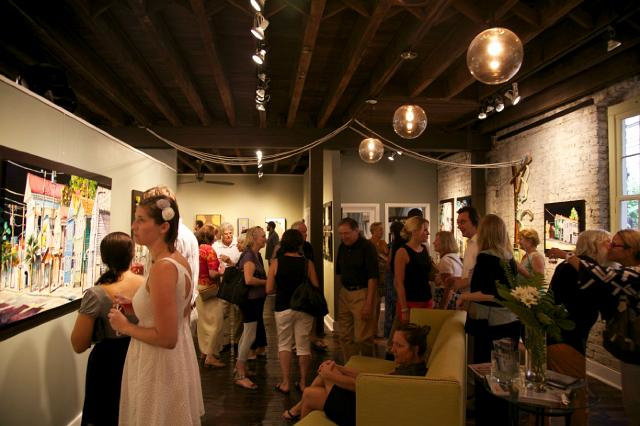 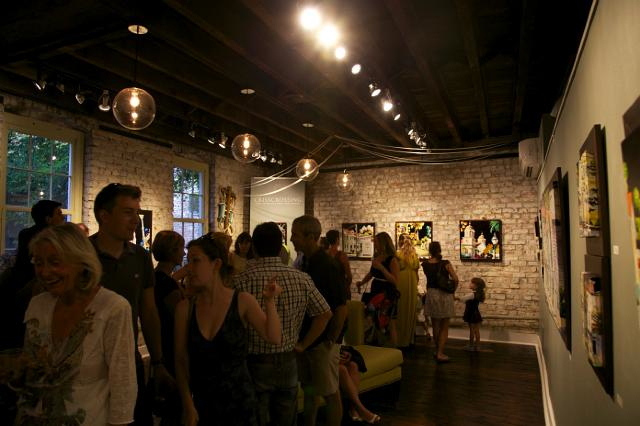 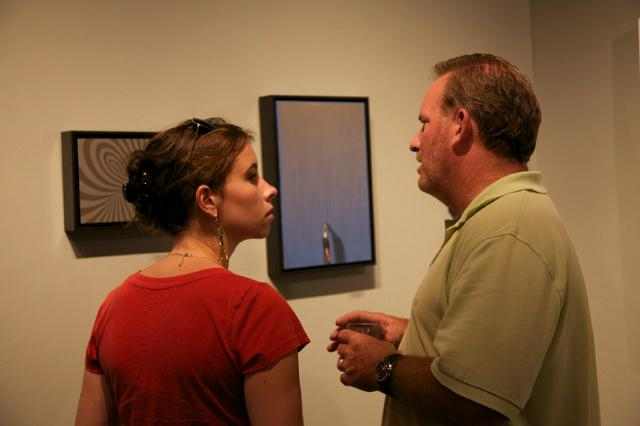 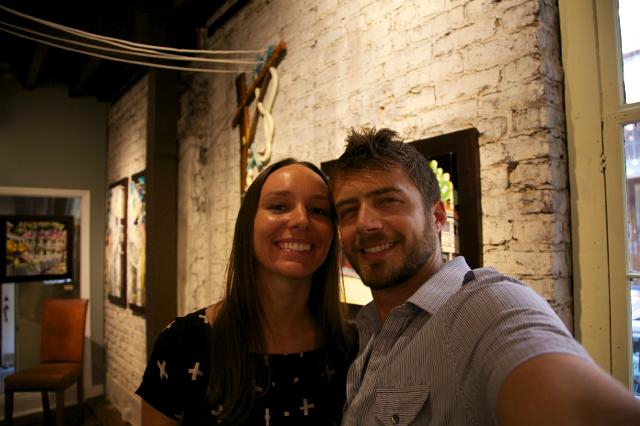 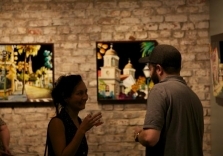 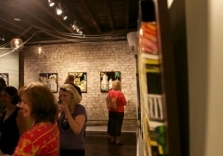 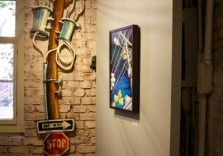 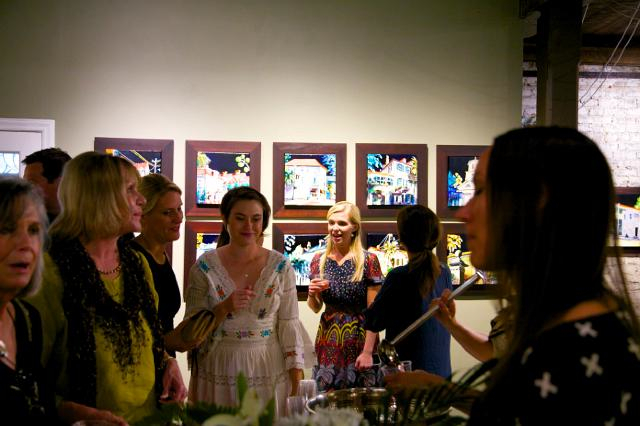 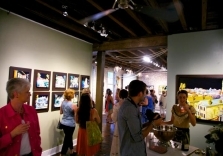 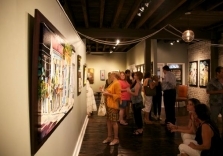 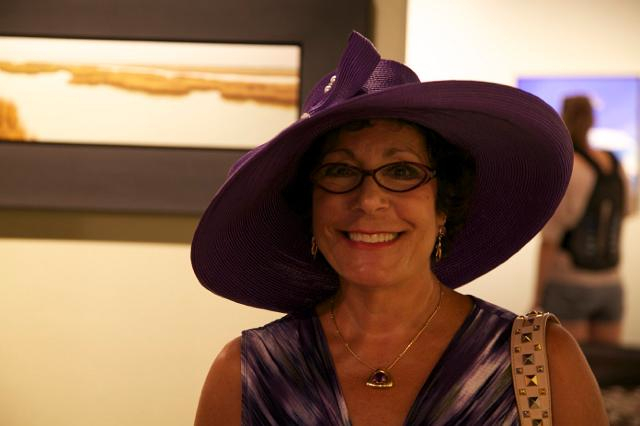 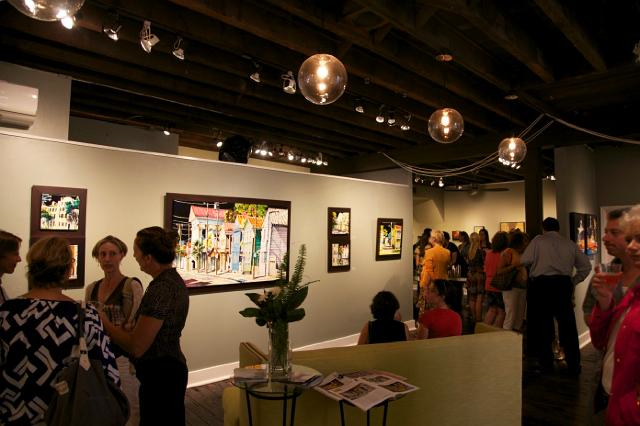 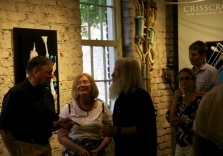 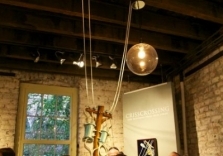 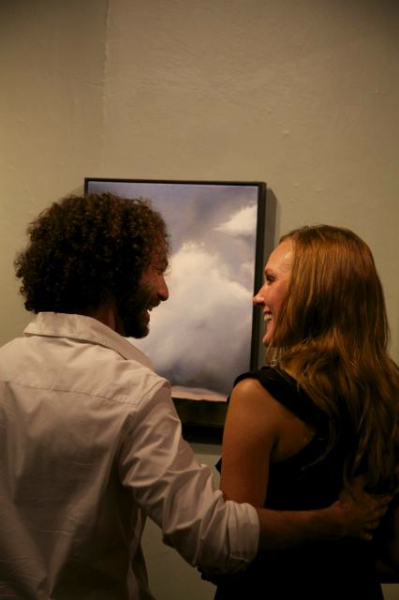 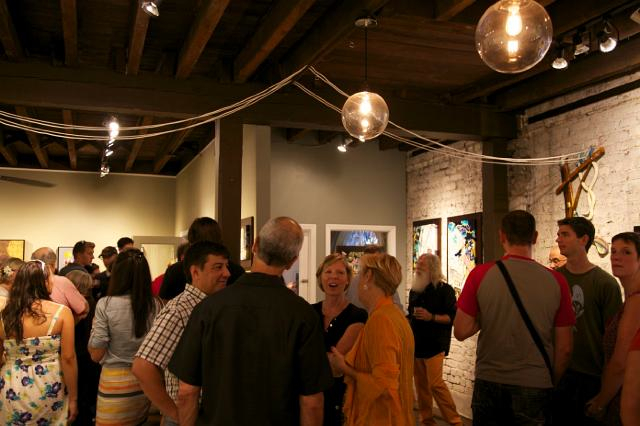 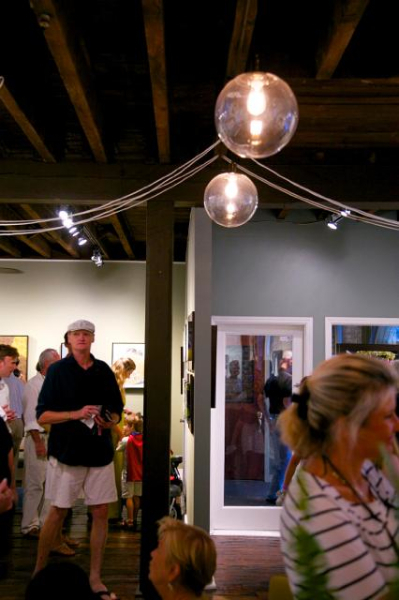 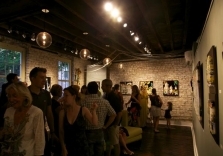 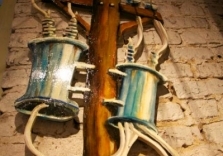 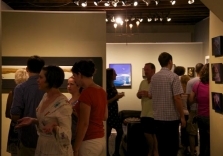 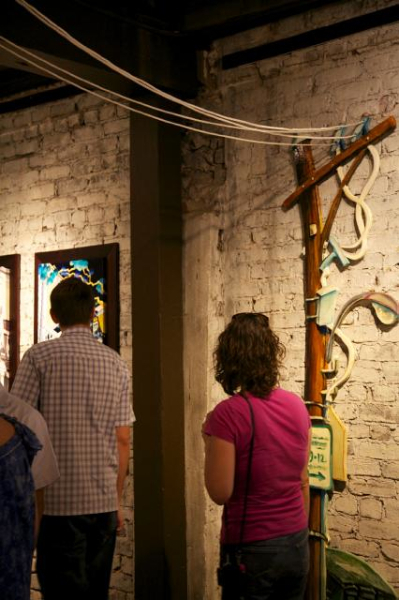 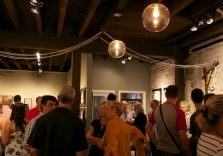 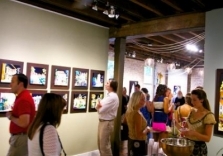 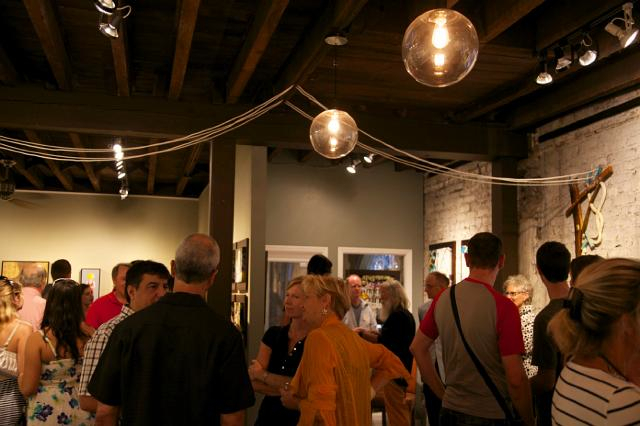 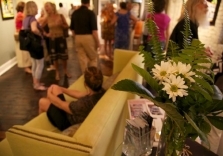 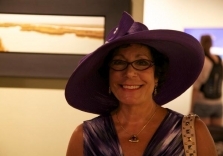 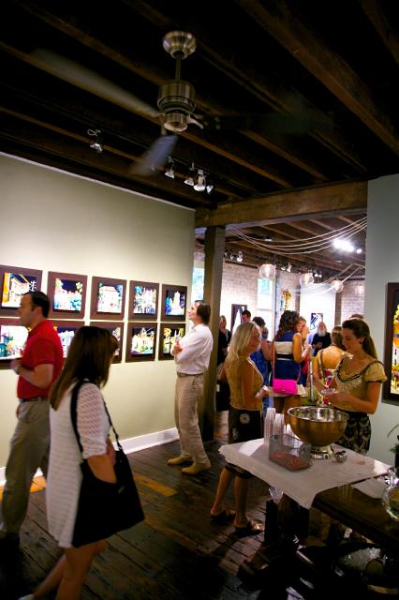 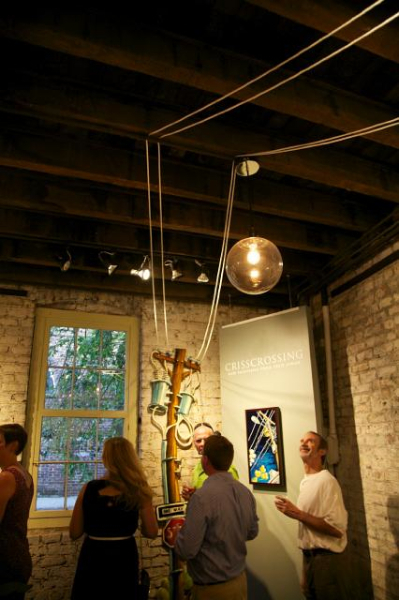 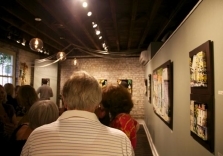 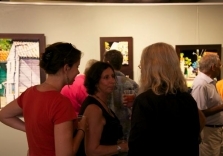 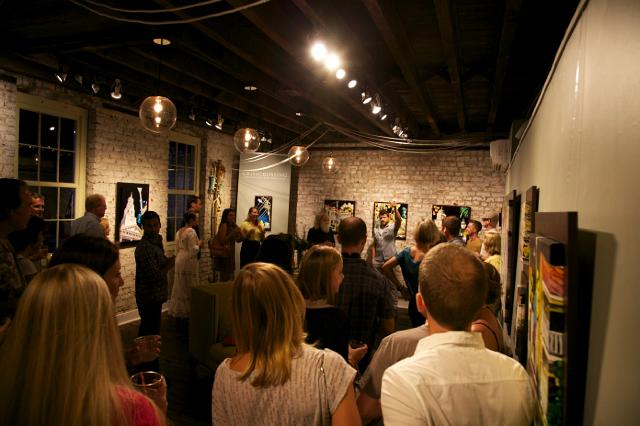 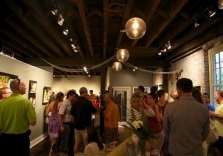 A casual wine-and-cheese reception open to the public will be held on Friday, August 3, 2012 from 5-8 p.m. and the work will hang until August 24.